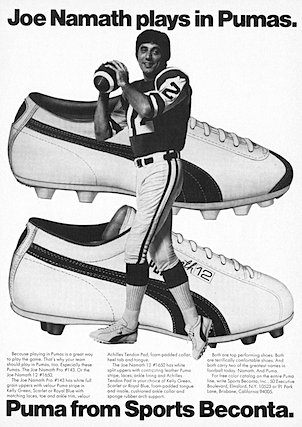 Joe Namath plays in Pumas. Because playing in Pumas is a great way to play the game. That’s why your team should play in Pumas, too Especially these Pumas. The Joe Namath Pro #143. Or the Joe Namath 12 #1650. The Joe Namath Pro #143 has while full grain uppers with velour Puma stripe in Kelly Green, Scarlet or Royal Blue with matching laces, toe and ankle trim, velour Achilles Tendon Pad, foam-padded collar, heel tab and tongue. The Joe Namath 12 #1650 has white split uppers with contrasting leather Puma stripe, laces, ankle lining and Achilles Tendon Pad in your choice of Kelly Green, Scarlet or Royal Blue, foam-padded tongue and insole, cushioned ankle collar and sponge rubber arch support. Both are top performing shoes. Both are terrifically comfortable shoes. And both carry two of the greatest names in football today. Namath. And Puma. 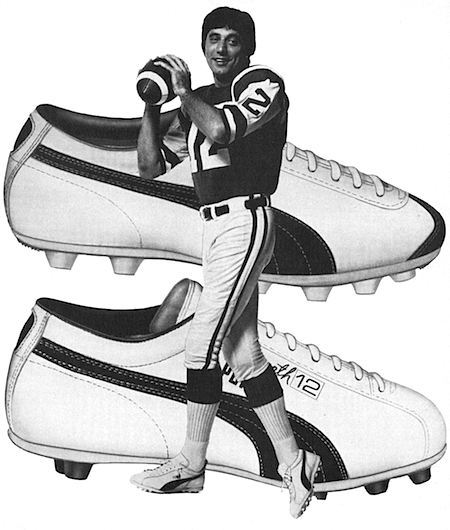 Puma Joe Namath signature shoes "Joe Namath makes all his passes in Pumas." Puma baseball shoes Feat. Reggie Jackson "Reggie in Pumas A shoe-in for MVP"